Though Michigan hasn't seen much of a summer, I've still managed to find my way to the grill every now and then. Things have slowed since the move to the North, but there are still countless exceptional BBQ products on the market just waiting to be reviewed. Fortunately, they still arrive at my doorstep from time to time. Recently, I've had an influx of new products that I'm really excited about. The eclectic bunch of products is highlighted by a one of a kind grilling sauce / BBQ sauce / marinade called Wild n Mild. This small, Mississippi based company was started by a couple college buddies who shared a love of good times and good food. Though rooted in family tradition, the duo tinkered with the flavor (and the name) until they settled on their signature "Wild" grilling sauce. Both the "Wild" and "Mild" versions of the grilling sauce are essentially the same recipe. The obvious difference is the additional spice factor found in the "Wild" version. Both sauces are packaged in 16 oz. plastic bottles (Mild also available in 1/2 gallon) and slapped either black or white labels. The packaging is simple, but the added color from the logo works as an attention grabber. The sauce is completely unique to the BBQ world making it difficult to describe. It doesn't fit into any standard BBQ sauce category. The sauce is a dark, caramel color similar to cola. Finely ground spices, pepper in particular, can be seen floating throughout. It's on the thin side and pours pretty quickly. Thankfully, the mouth of the bottle is tapered like a soda bottle slowing the flow. Wild n Mild has strong, tangy aroma. The vinegar was the first ingredient that really stuck out. It smelled somewhat like Italian salad dressing. The flavor, while strong, is very balanced. It's equal parts sweet and tangy thanks to loads of sugar and vinegar. The aforementioned spices give depth to the sauce's finish. The pepper lingered on my tongue after tasting it. There were several options for using this sauce, but I chose to use it as a marinade and grilling glaze for pork chops. I threw three thick cut chops in a plastic bag with about a cup of "Mild" sauce overnight. They hit a screaming hot charcoal grill the next evening. I basted the chops with some of the marinade while they cooked as well. I was incredibly pleased (and a little surprised) with how much sauce penetrated into the chops. The meat was juicy and loaded with flavor. The sugars help the meat caramelize and char to perfection. The flavors were a little sweet, but also quite savory. The vinegar tang was neutralized, but everything balanced beautifully. These were definitely the best chops I've grilled to date. Whether it's "Wild" or "Mild", this unique sauce imparts incredible flavor to meat. I highly recommend it as a marinade (steaks, chops or chicken) or grilling sauce. After reading the "How it all began" page of the website, I'm also looking forward to trying the sauce on smoked pork ribs. Check out http://www.wildnmild.com/index.html for more about Wild n Mild. You can order your own directly from their site. Don't forget to check our "Product Reviews" page for the Wild n Mild star rating. 1 Response to "Wild n Mild Grilling & Marinade Sauce"
Wild n Mild is an awesome sauce for marinating or mopping grilled or oven cooked meats. We've been using it for years and it' has a taste that no other sauce can come close to. It's just different!! The Back Yard BBQ Rub from Wild n Mild is also in a class of its own. I've competed in several competitions where I've used this rub to place 1st in the pork ribs and chicken. 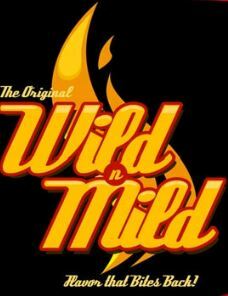 If you have never tried the Wild n Mild products then u must!!!! !